Following is a guest post from a friend in Philadelphia. A year ago when I moved to Philadelphia, I noticed the signs for Danlu. The long awaited opening and a meeting canceled at the last minute made it possible for me to be the first paying customer to sample their Taiwanese street-food inspired menu. 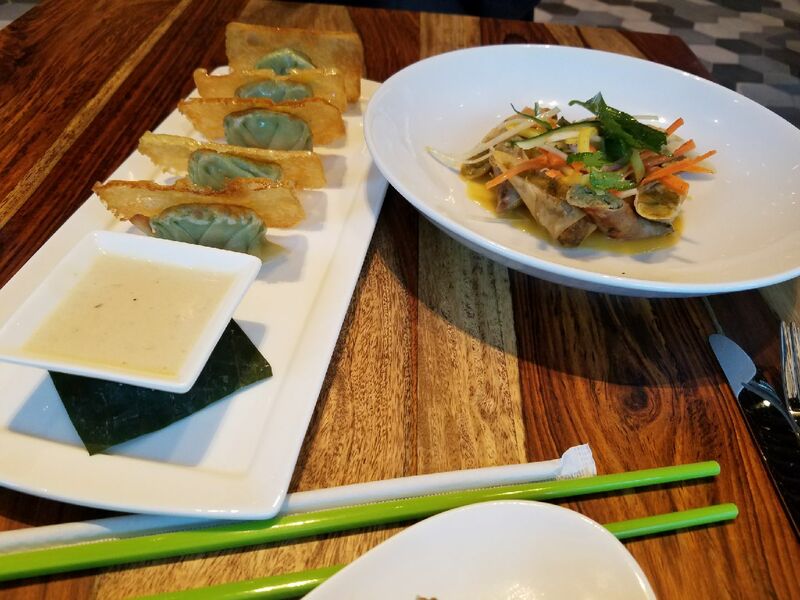 The Danlu crispy edamame pot stickers, served with a savory barrel-aged ginger vinaigrette, stole the show in a delicious meal. Each was framed* and beautiful, and tasted amazing. I had started with the grilled crepe with roasted chicken, pickled cabbage, peanuts, cilantro, and chilies, which I thought was great before tasting my next dish, which was a brightly colored array of pork sausage, curried potato spring roll and papaya salad with mango sauce. But it was the crispy edamame pot stickers, with their blend of crispy and soft textures and rich flavors that ensured I’ll be heading back regularly. Certainly, ordering three of their small plates gave me both enough for lunch and to take back to the office for dinner later, but the range was so delightful and the service so attentive that I was happy I had indulged in all three. I’ll look forward to returning, and already have visions of a happy hour with my research team in the coming weeks. * Editorial note: The edamame dumplings are cooked embedded in a layer of fried batter. Danlu then cuts squares of batter with a single dumpling in the middle and serves the dumplings in this frame of crispy fried batter. This entry was posted in Philadelphia, Potsticker, Vegetarian, Veggie Dumplings. Bookmark the permalink.